After months of testing across all tiers of its Insider program, Microsoft has announced that its Xbox One fall update is now finally available for all users. Since we first got a brief look at what the update might offer back in August, Microsoft has been gathering feedback and testing and refining new features ahead of this worldwide roll out announced by Mike Ybarra on the Xbox blog. Coming just ahead of the release of the highly anticipated new Xbox One X this update is, as you’d expect, a pretty big one and there are a lot of new features for users to get to grips with. There’s a heavy emphasis on personalisation with this update through the much more modular home screen. Now the home screen will be taken up by customizable blocks into which you can add things such as your favorite games, friends, Xbox Live Gold, Xbox Game Pass so that you can quickly access what’s most important to you at that time. If you’re playing a lot of one particular game, for example, you can make sure it has its own dedicated block on your home screen so that you can access it as quickly as possible. Or, if you’re particularly interested in what one of your friends is up to on their console, you can add them as a home screen block and more easily see all of their latest activities. There’s also more of a choice when it comes to color schemes, with new light and high-contrast options alongside the more traditionally dark palette. The Guide is also much faster to maneuver despite the fact that it packs in more features. Now, for example, if you bring up Guide while in an active party or broadcast it’ll have the smarts to open the party or broadcast section by default so that you can quickly access the controls. There’s a new “friends in games” flyout which will let you know when your friends are playing the same game as you and if you get an invite it’ll be much easier to see since it’s now housed in the Guide’s Multiplayer tab. While a more convenient guide is good for when you’re actively using your console, there are also new features allow you to stay connected when you’ve stepped away. If you’ve left your console idle, the new enhanced notification system means that time-sensitive activities and status updates will be visible from far away. If it’s been a while since you’ve even turned your console on, it’ll also be easier to catch up on all the friend and game activity you’ve missed with the new community feed. There are, of course, important changes being made that’ll be useful to those making the move to Xbox One X. To make set up as simple as possible for both new users and those making an upgrade, the new update will make it possible to transfer games via an external drive or copy them over your home network through network transfer (a slower method, but one that doesn’t require a sizable drive). Those who have a lot to transfer will be glad to know that the new bulk transfer feature means you won’t have to move each game and app individually. 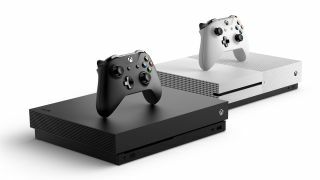 Those moving from Xbox One or Xbox One S will be able to download the 4K content for certain games to their console ahead of time so that they can transfer their Xbox One X titles over as soon as they have the new console. Speaking of Xbox One X Enhanced titles, they now have their own section in the store and it’ll be possible to sort and filter your installed and ready to install games library to find Enhanced titles specifically. Creators will be glad to know that Microsoft is also putting in some features to cater to their needs this time around, too. Taking the chance to push its Mixer streaming service, Microsoft has added a Mixer tab to the dashboard while will display broadcast previews so that you can see popular streams before jumping into them. Whether you’re broadcasting or watching, if your bandwidth supports a 1080p broadcast it’ll be automatically upgraded across your Xbox family of devices. For Xbox One X owners specifically, GameDVR will now be able to capture up to 4K/HDR screenshots and game clips and you’ll be able to capture content directly to an external hard drive. Overall, this is the biggest update we’ve seen for the Xbox One X in a long time and given that Microsoft has put it through several levels of testing and several rounds of feedback we imagine it’s going to be as smooth as it sounds. That said, Microsoft has said that it still wants to hear feedback from all fans so when you download it for yourself, it’s always worth letting them know if there’s something that doesn’t sit well with you.